If I was anything else but tanned this summer, I was lazy. My gym membership ran out, it was “too rainy” to run, and who wants to bust out the squats and lunges during a European vacation? Not me. So in order to get my body back into some level of physical fitness, I am beginning my 30-Day Yoga Challenge, which means practicing yoga every day for a month…and I want all of you to join me. Now before you start making excuses, I will explain how easy this will be and dare you to find a reason not to. If you have five minutes a day, to dedicate to a very simple series of movements and breathing over the next month, than I guarantee you will feel amazing. 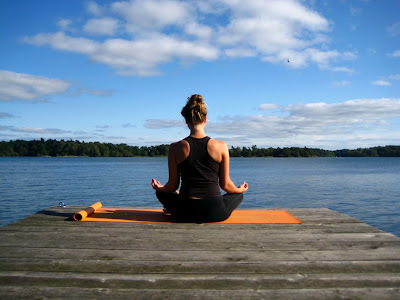 You don’t need any special equipment (although a yoga mat would be a good idea), and you don’t need a fancy yoga studio to do it (a dock on the river at sunset would also be a good idea) (sorry, that was mean). Even if you have never done yoga before in your life, you will be able to participate in the yoga challenge. Yoga is a system comprised of three practices, the most important being the breath, so if you can breathe, you can do yoga. The physical and mediation practices of yoga are also important, but I think that just committing to a month-long practice of breathing and simple stretches will be enough for me. I am also trying to curb my tendancy to bite off more than i can realistically chew. The 30-Day Yoga Challenge will begin October 1st, so you have just over a week to psych yourself into participating. Get your friends and family involved too, as it is good to have some support. The practice postures will be a series called the “Sun Salutation”, or “Surya Namaskar”, which is a series of 12 postures performed in a single, graceful flow. The Sun Salutation builds strength and increases flexibility (however, I should mention that this series does NOT include the posture pictured above, I was just showing off). Different styles of yoga perform the Sun Salutation with their own variations. However, the flow I will be presenting covers core steps used in most styles. If you are already familiar with the Sun Salutation, that is great. Let this be an opportunity to see what a difference it makes to practice daily, and feel free to add your own postures, as you like! Even if you cannot practice everyday this month, set small goals for yourself and take it day by day. Surprisingly it has been found that the body which may have been quite rigid starts experiencing a remarkable flexibility in even those parts which have not been consciously work upon. Why? It is here that the remarkable research behind yoga positions proves its mettle. Seemingly unrelated “non strenuous” yoga positions act upon certain parts of the body in an interrelated manner. When done together, they work in harmony to create a situation where flexibility is attained relatively easily. Massaging of ALL Organs of the Body – Yoga is perhaps the only form of activity which massages all the internal glands and organs of the body in a thorough manner, including those – such as the prostate – that hardly get externally stimulated during our entire lifetime. Yoga acts in a wholesome manner on the various body parts. This stimulation and massage of the organs in turn benefits us by keeping away disease and providing a forewarning at the first possible instance of a likely onset of disease or disorder. Excellent toning of the muscles – Muscles that have become flaccid, weak or slothy are stimulated repeatedly to shed excess flab and flaccidity. Still not convinced? Well, only the practice itself will be able to show you the immeasurable benefits of yoga. So, challenge yourself. Join me in the pursuit of reuniting with the body, the breath and the flow of it all. If you are interested in joining the 30-Day Yoga Challenge, write me an email at: sarahlbritton@gmail.com and I will post your first name on the “participant board” in October. Good for you! Four years later… I’m doing a yoga challenge and writing about it on my blog. I just happened to stumble on this post (even though I’m a follower now, I wasn’t when this was written). I love the pics of you doing the sun salutations, and your concluding post at the end of the challenge. Have you done the challenge again since then? I do it about twice a year (February and Fall) – I find my body (and my soul) just tells me when it’s time. I love to practice exercise, i think this activity is the best option to keep our total welfare and it is very fun. When we exercise frequently we can notice a change not only in our shape but in our mood too. Actually we can improve our sexual performance. When some cases when the erectil dysfunction present like a problem to buy viagra is a great alternative, how ever you must to combine it with exercises and a good food. I plan on doing it this August and was happy to find some information about other people doing it or who have tried it. How did it go?